Nonesuch Records releases "The Bright Mississippi", Allen Toussaint's first solo album in more than a decade, on April 21, 2009. Produced by friend and frequent collaborator Joe Henry, the record includes songs by jazz greats such as Sidney Bechet, Jelly Roll Morton, Django Reinhardt, Thelonious Monk, Duke Ellington, and Billy Strayhorn. Toussaint and Henry created a band of highly regarded musicians for the sessions: clarinetist Don Byron, trumpeter Nicholas Payton, guitarist Marc Ribot, bassist David Piltch, and percussionist Jay Bellerose. Additionally, pianist Brad Mehldau and saxophonist Joshua Redman each join Toussaint for a track. 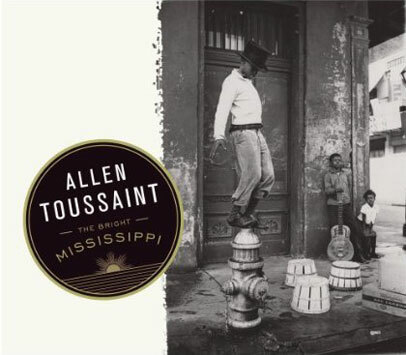 Nonesuch Records releases The Bright Mississippi, Allen Toussaint's first solo album in more than a decade, on April 21, 2009. Produced by friend and frequent collaborator Joe Henry, the record includes songs by jazz greats such as Sidney Bechet, Jelly Roll Morton, Django Reinhardt, Thelonious Monk, Duke Ellington, and Billy Strayhorn. Toussaint and Henry created a band of highly regarded musicians for the sessions: clarinetist Don Byron, trumpeter Nicholas Payton, guitarist Marc Ribot, bassist David Piltch, and percussionist Jay Bellerose. Additionally, pianist Brad Mehldau and saxophonist Joshua Redman each join Toussaint for a track. Growing up and learning to play the piano in New Orleans, Toussaint knew the music that is on The Bright Mississippi well, although his career tended more toward rock and popular music; he was inducted into the Rock and Roll Hall of Fame in 1998, by his friend and collaborator Robbie Robertson of The Band. This return to the music of his roots was suggested by The Bright Mississippi producer Joe Henry, who had produced Toussaint's 2006 album with Elvis Costello, The River in Reverse, as well tracks from as I Believe to My Soul, a collection of classic R&B and soul songs, and songs on Nonesuch's 2005 Gulf Coast benefit album, Our New Orleans. As Henry explains, "At the close of the day's Our New Orleans session, Allen sat alone at the piano and played through an arrangement he'd devised of Professor Longhair's Crescent City standard, 'Tipitina.' It sounded like nothing I'd ever heard before and like everything I'd ever heard." He continues, "In the weeks that followed I worried over this brief piece of music like it was a rosary, and I wasn't alone in my devotion to it. The principals of Nonesuch Records were thinking what I was: that a door had been nudged open, and behind it lay a room; and in that room there perhaps resided a particularly gifted and heretofore unsuspected executor of the broad musical amalgam born to New Orleans at the dawn of the 20th century." While Toussaint has always known material like "West End Blues" and "St. James Infirmary," he admits that, as a performer, "I hadn't tackled them on my own. 'Tackle' is a bad word—I hadn't caressed them on my own, except to listen from time to time in passing. Even the gigs that I've done during my gigging days, I was playing whatever was on the radio at the time, boogie-ing and woogie-ing and the like. I hadn't been through this standard bag. I always loved those songs, but I had never been in a setting where that is what I would do for a while. Until now." He calls the experience of making The Bright Mississippi "wonderful. Everything is live, of course. This isn't the kind of assembly line music where somebody put the wheels on here and somebody put the top on there. Everything got done at the same time, so everybody fed on each other, their personality and tonality."